Visitors to the Marist inner-city centre of St Patrick's, Church Hill, Sydney, will be the first to access printed translations of the short biography and Beatification Prayer for Marist Founder, Fr Jean-Claude Colin. 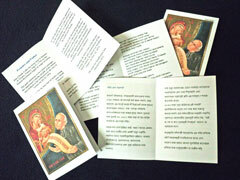 The small leaflet features Fr Colin's official icon in full colour. Bangla, German, Indonesian, Portuguese and Spanish language versions (as well as English) are the first to become available. They can be downloaded from here. Croatian, Dutch, French, Bislama and Samoan will be next. Keep watching. 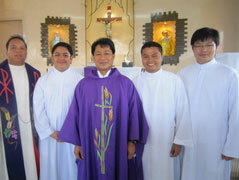 Three seminarians of the Marist Philippines Mission District renewed their religious vows in a simple ceremony at Davao, Mindanao, Southern Philippines, on Mar 25. 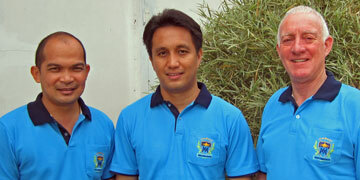 Formation director, Fr Chris Ganzon SM, reports: 'Bros. 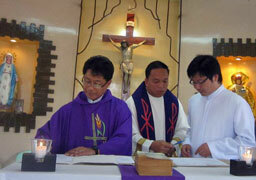 Nino Memorial, John Gouwang, and Roque Rebito renewed their vows today at the Sto.Nino Chapel in Davao City Jail. Fr. Larry Sabud presided at the Mass and accepted their vows in the presence of inmates and Marist friends. Above: Brs John Gouwang / Roque Rebito and Nino Memorial renewing their vows in the jail chapel. Below: District Superior, Fr Larry Sabud, received the vows, witnessed by Fr Chris Ganzon and members of local Marist communities. Fr Michael McVerry has been in Sydney for a week continuing work on a document detailing the 'principles, processes and practices' of the Marist Training Centre, Tutu, Taveuni, Fiji. A recent report records the centre's impressive range of development courses for married couples, young single men, young single women, parents, and parish and village leadership groups. 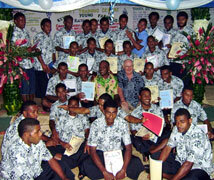 MTC is famous for the training of thousands of young farmers on Taveuni over 40 years and its support programs for married couples and families. 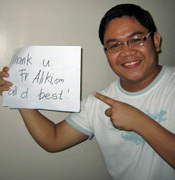 Fr Aliki -- farewell and welcome! The Australian Province welcomes Tongan Marist, Fr Aliki Langi SM, who arrived on Mar 22 from the Philippines Mission District to work at Star of the Sea parish, Gladstone, Qld. A veteran of 20 years missionary experience in the Philippines, Fr Aliki joins Frs Paul Mahony and Bernie McFadyen on the parish staff of Gladstone. At a farewell ceremony in Davao, Philippines, on Mar 20, Fr Aliki received blessings and good wishes from fellow Marists and friends. Above: Fr Aliki Langi arriving at Gladstone airport / with Frs Paul Mahony (parish priest) and Bernie McFadyen. 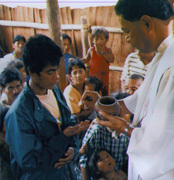 Below left: Farewells and blessings in Davao; right: Fr Aliki in remote mission areas of Mindanao. 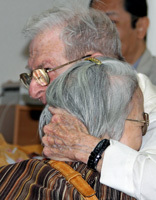 Following the wartime Changi prison and Thai-Burma railway experiences of Fr Lionel Marsden SM, a Marist mission was established in 1949 in Nara Prefecture, Japan, as part of the Australian Province of the Society of Mary. In moving ceremonies on Mar 17 the bishop and people of Nara farewelled the Marist Fathers as the 63-year old mission came to its completion. 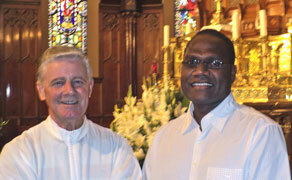 Explaining the simple and ongoing needs of missionary life in the Pacific, Vanuatu-born, Fr Dennis Revi SM, preached the annual mission appeal at St Patrick's, Church Hill, Sydney, over the weekend of Mar 17-18. Introduced by Marist Mission Centre director, Fr Kevin Stewart, Fr Dennis spoke at St Pat's many weekend Masses giving practical examples of the many needs of the local people. 'They so often come to their priest for material as well as spiritual help', he said. Newly-appointed leader of Marist Mission Ranong, Fr Kevin Medilo SM, is busy preparing local candidates for acceptance into the online studies program of Australian Catholic University. Fr Kevin reports that 13 students are presently being assessed. Veteran Kiwi missionary, Fr Pat Devlin, has recently joined the Marist team serving Burmese migrants and workers in the southern Thailand port city of Ranong. Burmese workers staff the fishing industry factories, many living in waterside slums districts. 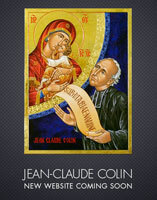 Work has commenced on translating a short biography of Marist Founder, Fr Jean-Claude Colin, which will be available on the approved Beatification prayer leaflet in 40 languages. The prayer is already available in 38 languages. Check for yours here. 42-minute 'must see' video of the plight of Internally Displaced Karen people in Burma as experienced by four young Americans.. 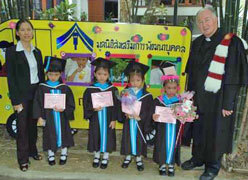 In the heart of Bangkok's Klong Toey slums Redemptorist missionary, Fr Joe Maier CSsR, and the community of the Center are celebrating the 50,000th child to graduate from their kingergarten program. 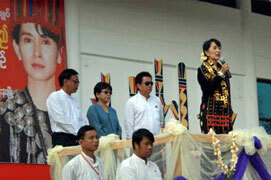 The impressive 40-year milestone was marked with ceremony and celebration on Feb 08. Fr Joe acknowledges that Australian Marists were the first to back the American missionaries in their work amongst the poor of Klong Toey when Marist provincial, Fr Peter Guiren SM, visited Bangkok In the early 1970's and offered assistance for the fledgling Redemptorist mission in Thailand. Above: A suggested 'masthead' for www.jeanclaudecolin.com. To register your interest in the site click on the icon below. 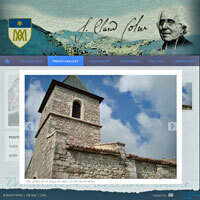 Work continues on planning for the website dedicated to Marist Founder, Ven Jean-Claude Colin. 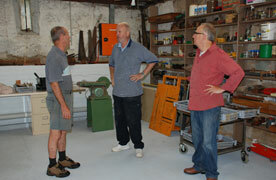 Web visitors continue to register interest in the site prior to its launching later this year. They will be notified in advance of the event. Preliminary design work on the site is being carried out by Catholic Communications, Sydney Catholic Archdiocese. Site content is being submitted to the Marist Fathers' General Administration, Rome, for recommendations and approval before the launch. 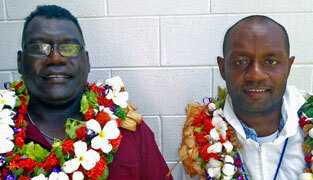 Hailing from Rohinari, Malaita, Godfrey has studied at Catholic Theological Institute, Bomana. 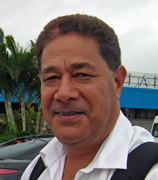 He made his Novitiate in Tutu, Fiji, and had his Marist mission experience year in Tonga. Oceania provincial, Fr Ben McKenna SM, received the vows in the presence of the formation community and representatives from the 8 other formation communiities at CTI where Godfrey is an 8th-year student. 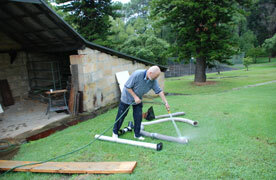 A monthly record of over 250,000 'hits' was recorded on www.maristfathers.org.au during February. The more significant statistic of frequency of individual visits and pages visited also peaked last month. 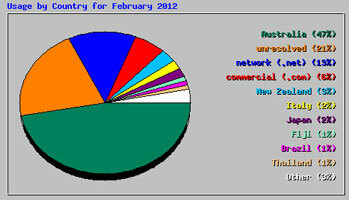 Visitors from 68 countries opened the Australian Marist web site in February. Top visiting countries were New Zealand, Italy, Japan, Fiji, Brazil and Thailand. If February's average was maintained then total visits for the year, including from commercial sources, would total over 85,000. 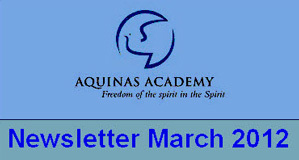 Click here for the latest newsletter of Sydney's Aquinas Academy. 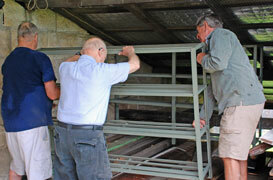 Work proceeds apace on the 'Men's shed' being fitted in the grounds of Villa Maria monastery, Hunters Hill, NSW. Thanks to the promise of community funding, regular working bees by local retirees have brought the shed to within months of an 'open day' and official opening. The historic Hawkesbury sandstone building was originally the wine cellar for Villa Maria's 19th century vineyards. 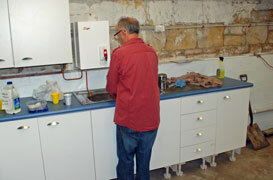 It will soon boast modern woodworking equipment, renewed plumbing and kitchen equipment. The latest number of 'Euro Info' is now available, an update of happenings in the Marist Province of Europe. 'Cycling for seminarians' rider, Br Charlie Randle SM, is nearing the end of his 500 Km annual epic. 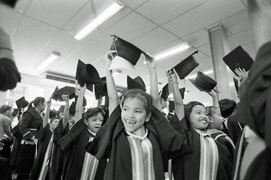 Young Marists in formation in many parts of the world, especially in the Asia-Pacific region, will benefit from Br Charlie's effort which raises about $50,000 each year. The yearly ride has been a feature of the Marist Mission Centre's fund-raising since 2000.